Terminator is highly configurable, and automate-able, so the Preferences dialog is naturally quite extensive. It currently consists of six tabs. Let’s work through them one by one. These settings are defaults, but some of them can be overridden by a options on the command-line, or within a layout. A number will also require a restart to take effect. This will determine what happens on startup normally. Normal - Window opens as normal. Hidden - Window does not open. Useful at login, so it is already available with a shortcut. Maximised - Window opens maximised in the standard window manager frame. Fullscreen - Window opens fullscreen with no window manager frame. New windows attempt to remain on top, until deactivated in the window menu. New windows will follow if you switch to a different virtual desktop, until deactivated in the window menu. This is a quake console like feature, where the user want the window to vanish when clicking elsewhere. This is rather buggy at the moment as it is very easy for the main window to lose focus and disappear. The first window opened will not be displayed in the taskbar. Subsequent windows will show in the taskbar (bug?). If this is checked, then when resizing Terminator will attempt to step the sizing by the current font, and display a small box with the dimension of the window in characters. If you have problems with Terminator windows shrinking in an uncontrollable way, then turning this option off will usually fix the issue. It is not clear why, but it seems Terminator and the window manager get into an argument over what size the window should be. Frankly this feature causes more trouble than it’s worth. Don’t be surprised if it gets removed at some point. If a Terminator DBus server is not already on the session bus, try to start one. By what method the mouse pointer sets the focus on a terminal. GNOME Default - Act as per the system settings. Click to focus - You must click with in a terminal to make it the focus. Follow mouse pointer - Moving the pointer over a terminal makes it the focus. All - All terminals receive keystrokes. Group - Only terminals in the same group as the current terminal receive keystrokes. None - Only the current terminal receives keystrokes. Make the right mouse button operate like in PuTTY, so right-click will paste the Primary selection, and middle-click will open the Context Menu. (For ex-PuTTY users). If enabled and there is no selection, the shortcut is allowed to pass through. This is useful for overloading Ctrl+C to either copy a selection, or send the SIGINT to the current process if there is no selection. If not enabled the shortcut does not pass through at all, and the SIGINT does not get sent. For newbies SIGINT is the keyboard interrupt signal that will interrupt the program running in the foreground of a terminal. When creating a new terminal with splitting or new tabs, if this is enabled, then the profile from the previously focussed terminal will also be used for the new one. If this is enabled then Ctrl+click on a URL will try to use the command defined in Custom URL handler to open the link. If not enabled, Terminator will attempt to open the link with its internal logic. In order this attempts to open the URL using GTK, xdg-open, and lastly pythons internal web browser support. If active and set, then URL’s will be passed as a command-line parameter to the given command. For themes we have the option to include some additional CSS code to make the window a bit prettier. 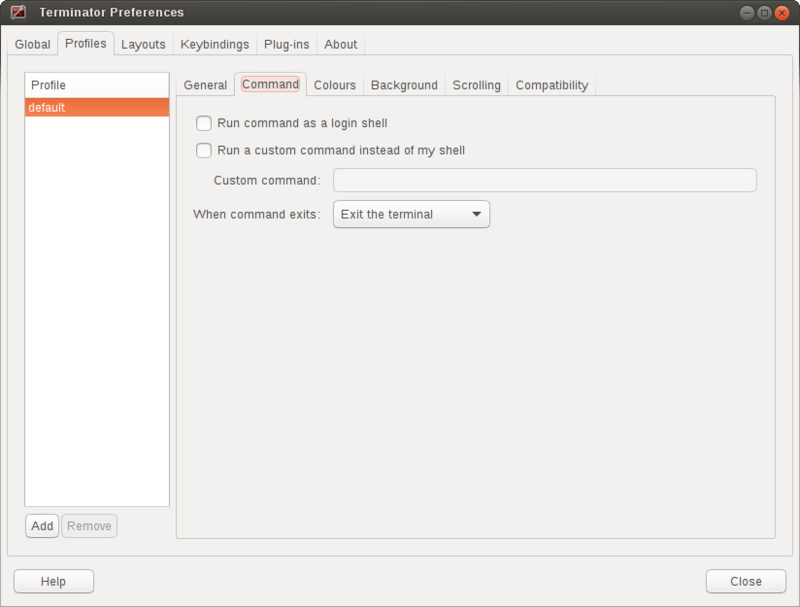 For example under the Ubuntu Ambiance theme GNOME Terminal has custom tabs. In line with our unofficial policy of following gnome-terminal, I have replicated that customisation for Terminator. Some may prefer to use the unadulterated standard tabs, so using this option the extra styling can be turned off. This is the width in pixels, and can range from -1 to 20. The value of -1 will take the default size from the system theme. Making this too small will make grabbing the splitters quite difficult, as we remove the oversized splitter handles some themes provide because it interferes with mouse selection of text. The window manager frame is removed from your windows. Hidden - Tabs still work, you just can’t see them. 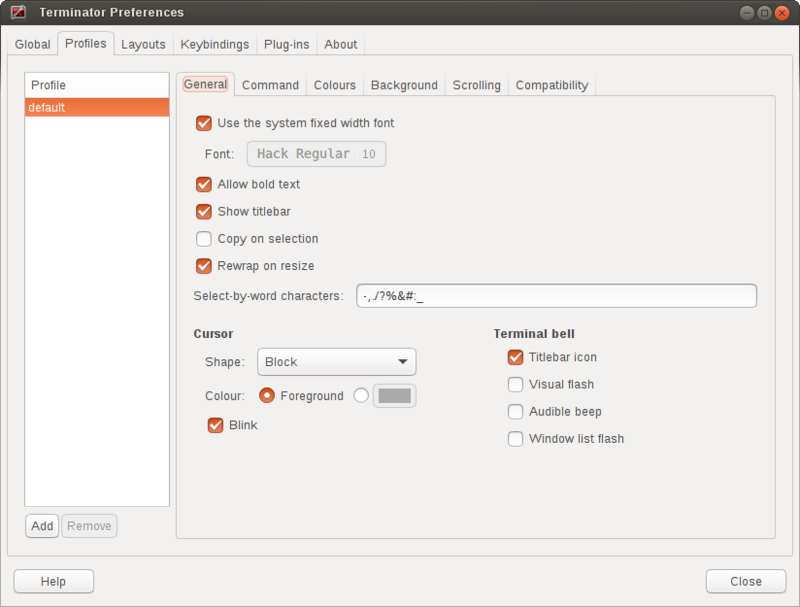 This option was removed during the port to GTK 3, and has no effect, apart from giving access to the Tab scroll buttons option. It used to give the choice between tabs of uniform and non-uniform width. When there are more tabs than can fit within the window buttons will be drawn for moving left and right. If the tab scroll buttons are turned off and you open an extreme number of tabs in a single window, an undesireable behaviour occurs. Once the tabs reduce to the minimum possible size the window is forced wider to accomodate additional tabs. It is not immediately obvious as to what the correct response is in this situation. There is a table of the colours for the titlebars on the left. These are modelled on those used in a utility I used to use called ClusTerm. The three sets (Focused, Inactive and Receiving) will make more sense after reading the section about The Grouping Menu. At the end of the label in the titlebar the size of the terminal is given in characters, i.e. (80x24). Enabling this item will disable the size text. By default the system defined proportional font will be used for the text in the titlebar. Turning this off allows you to use a custom font. If active and set, then the custom font to be used in the titlebar. You should already be familiar with the sub-tabs from GNOME Terminal, and Terminator’s are modelled on those available in GNOME Terminal where it makes sense, and give much of the same functionality. Below we will go through each pane, and highlight and explain differences between Terminator and GNOME Terminal. One key difference is that we have a sidebar to the left listing the available Profiles, as opposed to GNOME Terminal, where the list is a separate window launched from the menu bar. This also means a few of the widgets, like the profile name, are not needed. By default the system defined proportional font will be used for the text in the terminal. Turning this off allows you to use a custom font. If active and set, then the custom font to be used in the terminal. Allows you to disable the use of bold fonts in the terminal. The titlebar strip across the top of each terminal can be turned off. This puts the selection into the copy/paste buffer, as well as being available on middle-click. This will cause longer lines to rewrap when a terminals width changes. 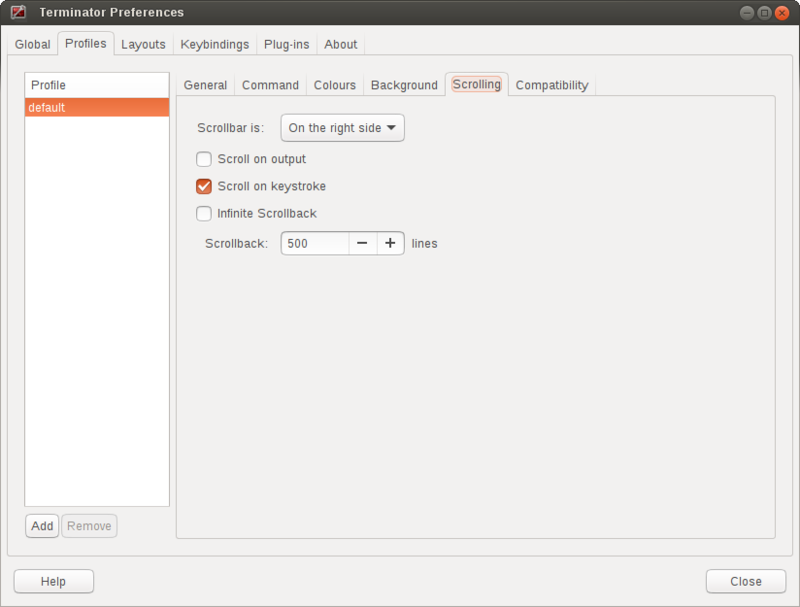 Larger or infinite scrollback buffers may become slow when this option is enabled. Using double-click to select text will use this pattern to define what characters are considered part of the word. Underline - Single pixel tall horizontal line. I-Beam - Single pixel wide vertical line. The colour of the cursor. A radio option of Foreground will use whatever the foreground is defined as for regular text, as set in the Colours tab. Alternatively a custom colour can be chosen using the colour swatch. Foreground uses xor’ing so the text under the cursor is always clear. Xor’ing is not used with a custom colour. This means that if the colour of the character under the cursor is similar to the colour chosen, then it can be difficult to discern what that character is. The following option can help with this. Whether the cursor blinks on and off. On the right side of the titlebar a small light-bulb icon will be displayed for a few seconds. The terminal area will briefly flash. The normal system beep noise as defined in system settings. This will set the urgent flag on the window in the taskbar. The actual effect will be taskbar dependant. Our profiles names are in the sidebar to the left. Ummm... OK, I have no idea what GNOME Terminal uses this for. Terminator doesn’t use a traditional menu bar. This has been removed in new versions of GNOME Terminal. Terminator has more options, so has four separate options in their own grouping. This item in GNOME Terminal is the same as Audible beep defined above. Terminator handles window sizes within Layouts, or with Command line options. Force the command to run as a login shell. Enable the use of a custom command instead of the users default shell. If enabled and set, the users default shell will be replaced with the command specified here. If you place an entry here note that there is no bash or other shell underneath it. When the command ends, there is no chance to drop to a shell or other program. This can be worked around by using the shell line seperator ; and a following bash command. When the running command exits (default or custom) what action should be taken. Exit the terminal - Terminal closes, causing layout to adjust. Restart the command - Original command restarts immediately. Hold the terminal open - The terminal and scrollback will remain visible and accessible until the user explicitly closes the terminal, or closes the window. If you are using Restart the command and your command is broken and exits immediately, then you can end up in a resource hungry loop. There seems to be some mild quirks and differences (palettes available or selected from the system theme) between Terminator and GNOME Terminal. Use colours as defined in the system theme. These are requested from the underlying VTE widget. Pick a primary colour combination for foreground and background. 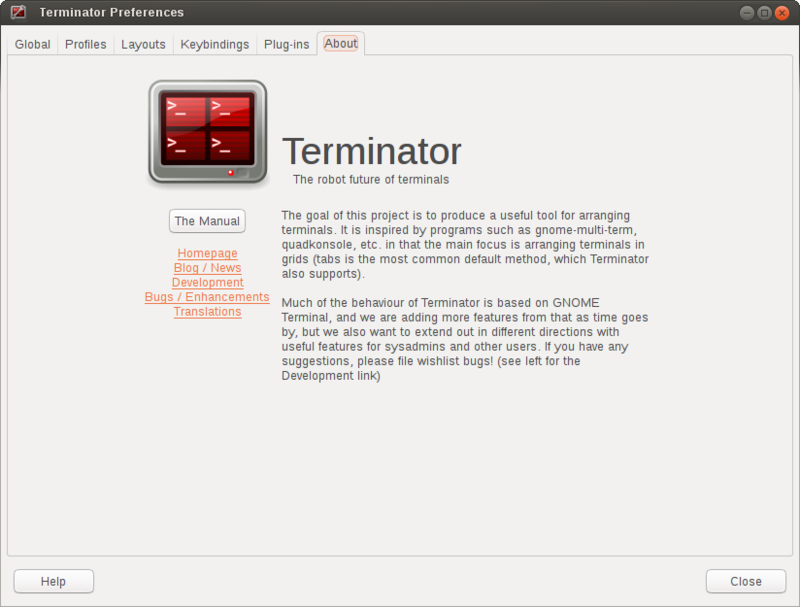 Again there are differences between Terminator and GNOME Terminal. If the Built-in schemes is set to Custom the text colour can be set here. If the Built-in schemes is set to Custom the background colour can be set here. 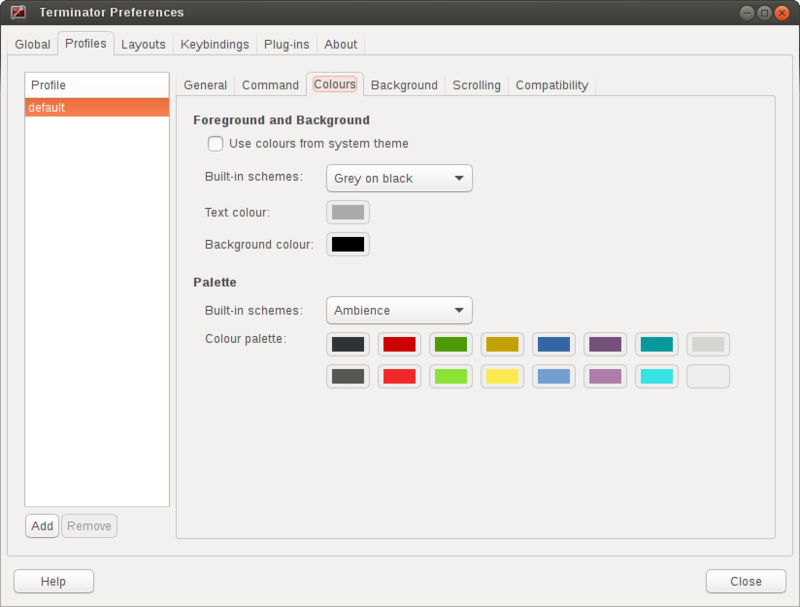 A predefined colour palette can be selected. The same text applies as used for the Built in schemes option under Foreground and Background . If the Palette’s Built-in schemes is set to custom, a set of colour swatches are used to configure the 16 primary colours of the shell palette. In theory nothing is stopping us implementing this, it just doesn’t appear to have ever been added. In truth, I’m not exactly sure what this does, but at a guess, the user can force bold to be drawn in the same colour as the foreground text. Our transparency has a tab all to itself. Not sure which setting GNOME Terminal gets this from. Background of terminal is set to the solid colour set in previous Colours tab. This will attempt true transparency where the windows below are partially visible through the terminal. This option requires a compositing desktop. For Transparent background this is how much the solid colour should be blended in, giving a tinting effect. If and where the scrollbar should appear. Moves terminal to end of scrollback buffer when any output occurs. Moves terminal to end of scrollback buffer when any keypress occurs. Lines are never discarded, and all lines since the session began are available. Data is placed onto the disk by the underlying VTE component, so even after a long time, the memory footprint and performance of Terminator should be OK.
How many lines to keep before discarding. Change behaviour of the Backspace key. Change behaviour of the Delete key. Choose the default encoding method used from a long list of available encodings. Sets the previous items back to their defaults. Not really too sure what this does. Layouts are the primary means for saving collections of windows, tabs, and terminals. 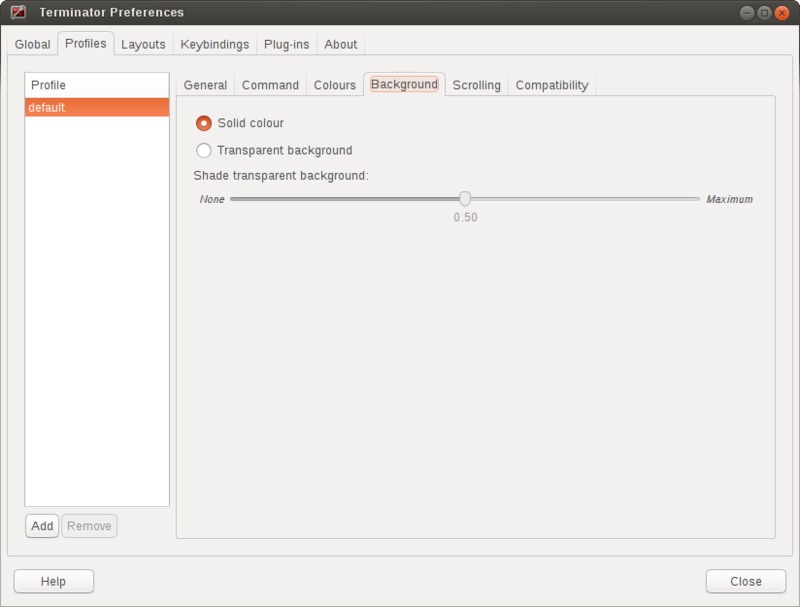 The use and flexibility of layouts is covered in Layouts and the Layout Launcher. Here we will cover the bare minimum to understand the configuration options. Add - Creates a new layout from the current windows, tabs and terminals, and saves them with a new name. Save - Update the selected layout with the current windows, tabs, and terminals. You do not need to use the save button when changing the options in the controls on the right. If you do, you will lose the Custom command and Working directory settings for all terminals in this layout. It will also replace the saved layout with the current layout. This means your windows may now be the wrong size, or in the wrong position. Once a layout is highlighted, its name can be changed by clicking it again. In the central list is a tree showing the structure of the selected layout. When highlighting an entry of type Terminal, the controls on the right become enabled, and can be changed. 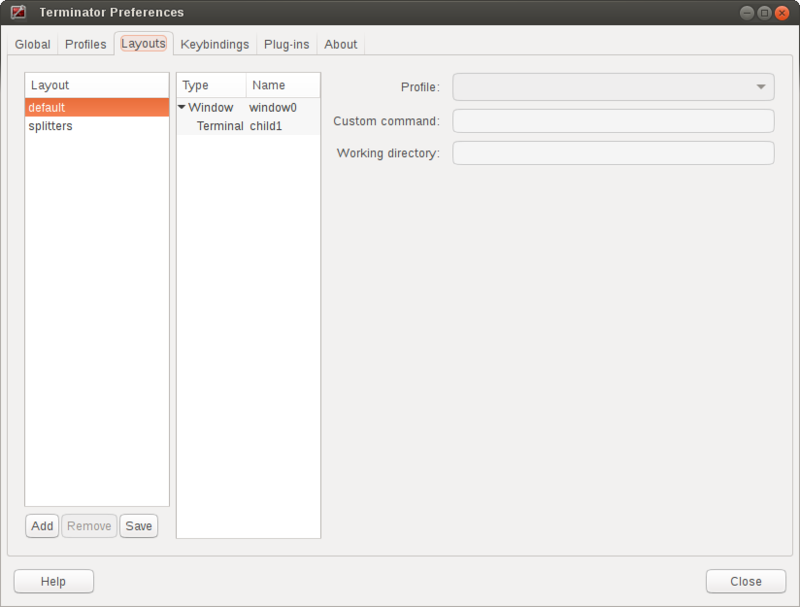 The profile used by the select terminal as listed in the Profiles tab. Override the command run in the terminal, same as in a profile, but this one has a higher priority. If empty, it will run the command in the profile, or the default user shell. If you place an entry here note that there is no bash or other shell underneath it. However, note that the second bash will have no connection to the details of the bash the command ran under. This means no environment variables, or return codes are carried over. Whatever command is run (from layout, profile, or user default) it will be executed with this entry as the working path. If empty the default working directory is used, which is either where Terminator was launched from, or the users home directory. 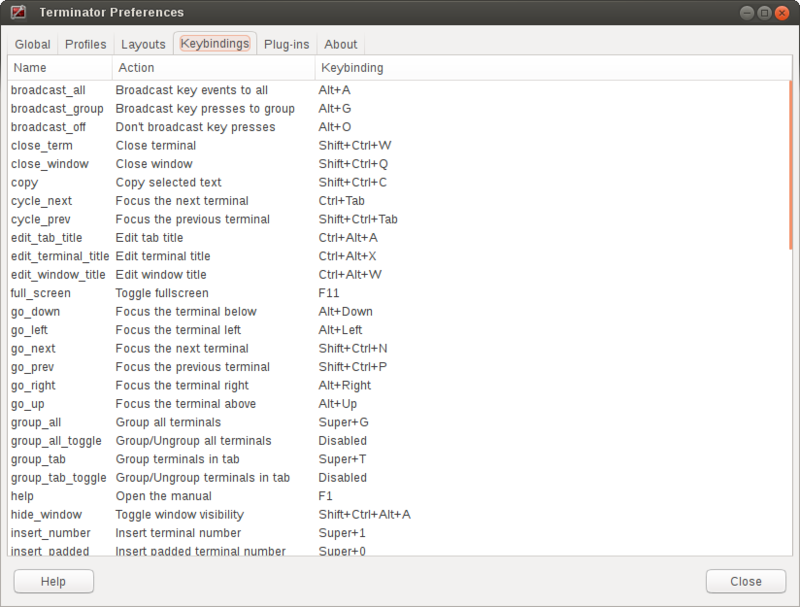 This is a list of all available keyboard shortcuts in the application. To change a keybinding, first highlight the entry you wish to change. Next click on the Keybinding column again. The entry should change to New accelerator.... Simply perform the shortcut you wish to set. If you change your mind use Esc (Escape) key to revert back to the existing shortcut. If you wish to delete a shortcut, use the BkSp key (Backspace, ←, or ⌫ depending on your keyboard). Here you will find a list of available plugins, and whether they are enabled or not. Plugins are covered in more detail in Plugins.